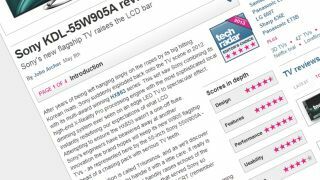 At TechRadar our goal is to provide you with the most in-depth and helpful tech reviews anywhere on the web. By the time you finish reading our reviews, you should have all the information you need to decide whether you want to buy the product or not. Design: How does the product look and feel? Is it well built or does it feel cheap to the touch? Features: Does it have the features and functionality that we expect, need or want? Usability: How easy is it to use and get the most out of? Are the controls in the right place and is the interface logical? Performance: How well does the product work? Do all the features perform as they should? Value: Is the launch price good value when weighed against the other criteria? The scores will be displayed on the first page of reviews. We're always working to make TechRadar the best it can be, so if you've got any thoughts on the way we could improve our reviews, please let us know in the comments below or on Twitter to @Rungsberry or @TechRadar.